Alex: Oh, Bob Dylan. I don't think I have any Dylan on hand. But what I do have is “Keep your hands to yourself” by the The Georgia Satellites. We'll do Dylan next time. Alex plays “Keep your hands to yourself” by The Georgia Satellites. Eric: We thought it would be good to talk about a new article that just came out in JAMA IM I think a week ago. “Association of Increasing Use of Mechanical Ventilation Among Nursing Home Residents With Advanced Dementia and Intensive Care Unit Beds.”. Ken: Oh, that's a mouth full. So, I was really stuck by one finding in this study and I wonder what you two think of this. It said, "from 2000-2013 the chance that a patient with advanced dementia will get mechanical ventilation doubled. And presumably the illnesses haven't changed over this time. So that for some reason, we are using this procedure, this highly invasive procedure twice as often in people with advanced dementia. And you know, not only that, it varies wildly depending on what hospital a patient goes to. So, it's not necessarily based on how sick they are. There is some feature of the hospital that seems to be dictating whether or not they got this procedure. Eric: Yeah, It did seem that a big feature of that was just the number of ICU beds the hospital had or added. Ken: But one would hope that regardless of how you feel, how often this procedure should be used… One would hope the decision about whether a patient with advanced dementia is subjected to mechanical ventilation is based solely on patient benefit, that you think they will be better with that. And it appears that a huge part of what's driving the decision is if you show up in a hospital that has a lot of ICU beds, you end up in an ICU and then what are you going to do? When you are in the ICU, you go on a ventilator. So, that doesn't seem to be a good reason to be doing this procedure on patients. Eric: Yeah, and I guess that was the surprising things for me. My assumption up to this point was if you had pneumonia or are in a nursing home you could potentially treat that pneumonia in a nursing home and prognoses may look very similar between those who get admitted to a hospital and those who don't, to the point where we are thinking about mechanical ventilation. My thought was, they are in respiratory distress, they either need it or they don't. One will improve survival (mechanical ventilation), because the other person is going to die without it. I think this study begins to question that because there has been a doubling in the use of mechanical ventilation but also there was no improvement in one year mortality. Ken: Well, that was striking Eric. So they did this really interesting analysis; they looked at the hospitals that were in the top 10% of using this procedure and then they looked at the hospitals that were the least likely to use it, the bottom 10%. You would think, okay well maybe there is a cost here, it's an uncomfortable procedure, it's scary, buy maybe some patients gain a longer life because of this. But that's not what happened. There was absolutely no difference in survival between hospitals that use this a lot and use it a little. So this seems to be doing nothing for patients, this increased use of mechanical ventilation. It seems like: is this all harm and no benefit? Alex: It depends on what the outcomes are when you are assessing harms and benefits. You could see that there are some patients who do survive the mechanical ventilation, that ICU stay, who have benefited from being in the ICU - but this isn't a randomized control study. We can't know that for sure. But my concern is - I don't allow that there are some patients who benefit - but I would say that the harms and the risks to patients are serious and we have alternatives that likely are more comfortable for patients who have advanced dementia, for whom an ICU stay is debilitating, frightening, and often leads to death in any case. Ken: Yeah, I think one has to be careful about when you have a large epidemiologic study like this, one can't always go down to an individual patient and say that based on what this big study says, we know what's right for every individual. Because, when we practice medicine we have to base it on evidence but then we have to modify that evidence by the person right in front of us. And sometimes there are very good reasons why the evidences doesn't apply. Sometimes when patients are put on mechanical ventilation in this situation there may really be a belief that the patient is going to benefit but it may actually be the case that they are not benefiting at all and may they are even being harmed. Putting them on simple oxygen without the ventilation, treating them with antibiotics and supporting them maybe there is just as much of a chance of survival as with mechanical ventilation, but without all the horrible suffering that goes along with it. Eric: I can clearly remember multiple patients that I worked with whose goals are very much focused on survival. Now, even in a state of being bed bound, in a nursing home, that they will would want life sustaining intervention such as; mechanical ventilation; or anything else; including dialysis, that they have stated in their past preferences when they have talked with individuals, like family members, and they may have even written an advanced directive. 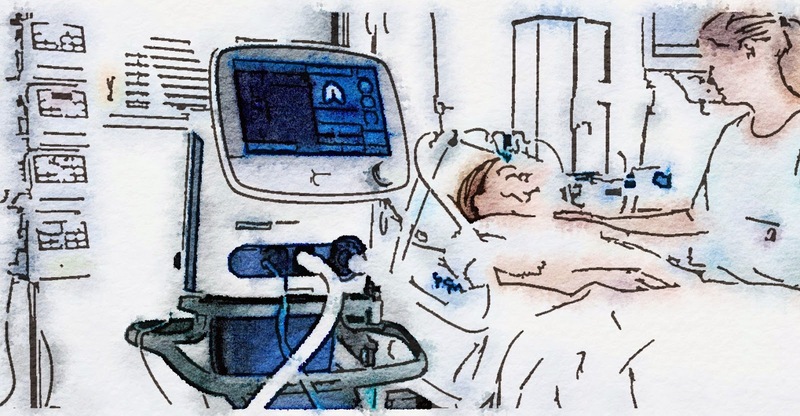 So, for those individuals, how should we think about mechanical ventilation for them? Ken: I find that a really hard question, Eric. And I am interested how the two of you discuss this issue when you are attending on palliative medicine. I mean I think the way I have come to think about it is, we need to really honor patients and families who length of life is really important to them and they want to do all they can to live as long as possible but we also have to be honest about the limits of medical intervention. So that it's sometimes believed these interventions that are potentially life prolonging are life prolonging in all instances. In fact it's the case that sometimes dialysis, for example, is not prolonging and sometimes mechanical ventilation is not life prolonging. That sometimes medicine has its limits and that sometimes our ability to prolong life is very limited. And advanced dementia is probably a situations that epitomizes that. This study really calls into question whether this procedure even is achieving its goal. Eric: Maybe akin to the early studies looking at feeding tubes. Where the underlying thought before the early studies were, of course feeding tubes prolong survival, how could they not? They are adding nutrition to this individual. It must increase survival. Everything that has come out shows that it doesn't. Well, likely because they are dealing with the disease they are dying from, rather than, they are just not getting enough nutrition. Ken: That's a really good point with respect to advanced dementia, is that when patients get these complication we think of it as the complication that is hurting them. The complications are signs of how bad their dementia is and how much it has progressed. And treating the complication does not treat the underlying dementia. The treatment of advanced dementia is primarily palliative. The medically invasive things often, would do more harm than good. I think there is also a bias - that I think is really common - that when a procedure has been done and the patient does okay after the procedure, there is an assumption that the procedure helped. So that, you are put on a ventilator and you are live. Therefore, the ventilation saved your life. This study suggests that's probably in fact not happening. We don't know what would have happened to that one person if we didn't put them on a ventilator. But it's generally possible, and this study suggests that it's likely that if the patient wasn't put on the ventilator, they would have survived as well. But they would have survived without that trauma. Eric: My last questions is, what do we do with this data? How can we improve the lives of individual with advanced dementia, living in nursing homes, when it seems like we have developed a healthcare system that is really good at achieving its results that it’s getting, which is -and this comes from other data from Joan Teno - is that the system is very good at churning through patients. Getting them transitioned between multiple settings in the last six months, month, of life and really focusing on hospice care maybe in just the last three days of life. Alex: I think that there are several answers. One is that we need to understand the problem better. So if we had more research to understand what's actually going on in the nursing home. And some of that is more qualitative, asking the “why is this going on?” sort of questions that are hard to answer with a secondary data set study like this. But we already know that there is some low hanging fruit here. The primary approach to caring for patients with advanced dementia in nursing homes should be palliative, palliative, palliative, palliative, and that's just not the case. And some of that has to do with cultural issues, some of it has to do with reimbursement and financial incentives for nursing homes. But we need to do a better job of incorporating a culture of palliative care in nursing homes in the United States. And that's, I think, is the first place to start, and we don't need more evidence before we start doing that. Eric: The need is definitely there. One out of four residents will die in a nursing home. For palliative care, palliative care is now in more than 90% of hospitals with more than three hundred beds, palliative care is being integrated into clinics and cancer centers. Palliative care programs are being developed for home based palliative care. There is a dearth of palliative care outside of hospice and nursing homes. The field of palliative care has to think of models, where we can actually deliver palliative care in these settings. It just reminds me of a recent article that came out in JAGS that we wrote about in GeriPal just a week ago. The study looked at data from two palliative care provider organizations that were subsidiaries of hospice agencies, and they identified those patients who got palliative care consultations in North Carolina and Rhode Island. And what they found was those individuals who got palliative care consultations had reduced hospitalizations in the last seven days of life, last thirty days of life, last six days of life, reduced ED visits in the last thirty and sixty days of life and fewer burdensome transitions, including going to the hospital and the ICU. So, I think that an important part of this is as palliative care providers and organizations, we also have to start thinking about the nursing home as an important place where palliative care needs to take place. Not just primary palliative care by nursing home providers but giving specialty level palliative care to these individuals as well, when they need it. Ken: Oh, this is a provocative study. I mean it is impressive how the [inaudible 14:06] in our group just keeps adding to our knowledge on how to better care for patients with dementia. Eric: And if you want the link to the article it will be on the GeriPal website, as well as other articles that we cited during this podcast. Alex, can you give us one more verse? This is such an important topic. I've spent many years as an RN working in nursing homes, even one that had a long term ventilator unit. I feel that what is so needed is education for nurses on how to talk to patients and their families about end of life and then let nurses discuss palliative care. Nurses in nursing homes develop relationships with patients and their families and would be an effective vehicle for these discussions. Palliative care isn't the focus of care for nursing home patients and for many of them it would be of great benefit.